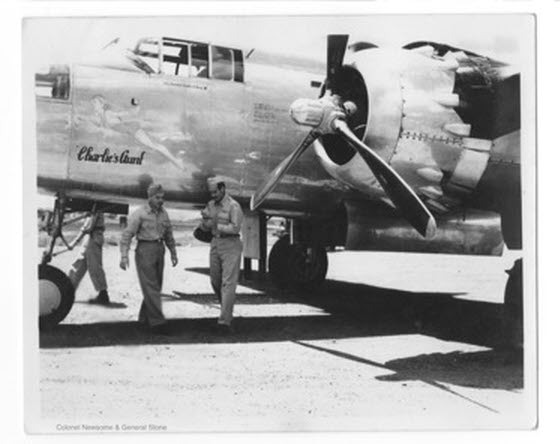 This picture shows Colonel W Newsome, Commander, 341st Bombardment Group from 16 April 1945 and General Charles B. Stone III, chief of staff for the Eastern Air Command, at Kunming in 1944-45 then Commander of the 14th Air Force from the summer of 1945. Many thanks to Steven James for providing us with these pictures, which came from the collection of his father, Captain Harold C. James, a photo technician with the 11th Bombardment Squadron, 341st Bombardment Group, based at Kunming in China.